Contagion depicts the spread of a highly contagious and deadly virus which rapidly spreads across the world and threatens to kill hundreds of millions of people unless an international team of scientists can develop a vaccine fast enough to stop it. The film is a disaster thriller in the hyper-realistic style of Syriana. It even stars Matt Damon as a father of two whose family is among the first affected by the virus. As the virus spreads, the death toll rises and society begins to decay as desperate people search for a cure and fight for survival. 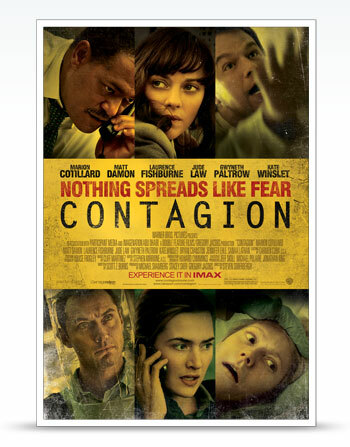 Contagion is a uniquely scientific film. Pleasing for someone like me. It’s also educational. The film was made with the cooperation of the Center for Disease Control (CDC), and this shows in the realistic depiction of scientific research, procedures, planning, and of course the media response and skepticism. Yet for a movie so graphically depicting our worst fears of humanity sliding towards the precipice of extinction, there is very little reflection on the end of the world, apart from two peripheral characters. Or perhaps that is the movie’s message. One character refers to a CDC scientist as “Jesus in a lab coat” – the one to save society from the pain and suffering of this world. Which it can. To an extent. Science has brought tremendous advancements in terms of public health, medicine, medical technology to detect illnesses, to treat the human body and our physical afflictions. Young Jory Emhoff expresses something of these limits when he asks his father (paraphrased) “why can’t they invent an injection to stop time?” This is both an appeal to science to save him and an expression of how we humans are locked into time – stop time and you can enjoy a moment for as long as you like; you pause the processes which lead to our inevitable end. Ultimately it’s a cry to defeat death. And Jesus came to heal more than our physical malaise. The kingdom of God promises restored relationships too – relationships defined by generosity, humility and self-sacrifice. As society decays, people loot and kill in the fight for survival; people are crushed in desperate scuffles over one (potential) source of hope. At what point do ordinary people put one life over another? While hoping in what may or may not be? Science is good for what it is, but a vaccine won’t prevent us turning into barbarians when our world falls apart nor can it salve our deepest fears of what lies beyond the moments we breathe our last.